For men with metastatic disease, no difference between conservative and aggressive treatment was found. 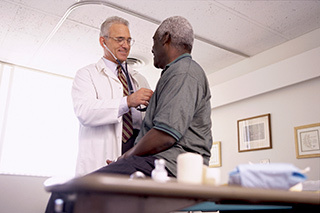 (HealthDay News) — For men with metastatic prostate cancer, there is no survival advantage for aggressive therapy over conservative androgen deprivation therapy only, according to a study published online March 2 in Cancer. Marc A. Dall’Era, M.D., from the University of California at Davis Comprehensive Cancer Center in Sacramento, and colleagues identified men diagnosed with locally advanced or metastatic prostate cancer. Survival was compared by treatment type: conservative (androgen deprivation therapy only) versus aggressive (radical prostatectomy or any type of radiotherapy). The nine-year overall and prostate cancer-specific survival were estimated. The researchers found that conservative treatment alone correlated with a four-fold increased likelihood of prostate cancer mortality versus treatment with surgery for men with advanced, non-metastatic prostate cancer (hazard ratio, 4.18). For men with metastatic disease, after adjustment for covariates, there was no difference between conservative and aggressive treatment. The nine-year prostate cancer-specific survival rates were 27 and 24 percent for men receiving aggressive treatment and conservative treatment, respectively.